In previous columns I have written about how country’s iron songbirds of the ’50s, ’60s, and ’70s were forced by the attitudes of the time and the conventions of the genre to adopt a series of socially acceptable personas, like the cheated-on wife, the fierce protector of the domestic front, the other woman, or the lovesick brooder pining for the one that got away. The subject matter of their songs was circumscribed by the same restrictions that governed their lives. A male country singer could do as he damn well pleased, and, as the lives of Hank Williams, Merle Haggard, Gram Parsons, and countless other blazing comets of epic self-destruction illustrate, they took full advantage of that privilege. But the women of country had to behave according to the dictates of an often sexist and conservative country world. As strong as Tammy Wynette, Kitty Wells, and Loretta Lynn were, they were defined, in their early albums at least, by their relationships with men. The same cannot be said of Patsy Cline. In a genre that all too often resembled a tinny Western on a black-and-white television, Cline sang in Technicolor. Her voice alone—a deep, rich, lustrous marvel of velvet and stardust—seemed to push her into a much bigger, bolder world than the domestic prison that trapped so many of Cline’s peers and predecessors. Cline’s was the voice of experience: sensual, romantic, knowing, and wise. It demanded to be treated with respect, if not reverence. It was a voice almost too big for country. Though she never thought of herself as anything other than a country singer, Cline’s seminal songs and albums have the slickness and polish of pop and the sophistication and emotional complexity of jazz. The icon’s recording career was extraordinarily brief. In her lifetime she only released three albums: her self-titled 1957 debut, 1961’s Patsy Cline Showcase, and 1962’s Sentimentally Yours. Cline died in 1963 at age 30, yet she didn’t need more than a few years to change country and pop music forever. Cline took country places it had never been before, but she shares the modest, hardscrabble roots of so many of her peers. She dropped out of high school and got married at 21 to a much older man who resented her success. Yet Cline had the kind of voice and talent that could not be ignored, and in 1955 she signed to Four Star Records. The singer’s ascent to glory kicked off when she sang “Walkin’ After Midnight” on Arthur Godfrey’s Talent Scouts, a popular television talent show. Cline was used to performing in homemade cowgirl Western wear her mother made her, but for her big national television appearance she sported a cocktail dress that sent an unmistakable signal that she wasn’t about to be hemmed in by the confines of country. On “Walkin’ After Midnight,” Cline follows the old dictum to sing a happy song sad and a sad song happy. There isn’t a lot of levity to lyrics about a woman searching desperately for a lost love in pools of mocking moonlight, but Cline delivers sorrowful lyrics about spotting a “weeping willow crying on his pillow” with a light, bemused touch. Here and elsewhere, Cline finds a paradoxical strength in conceding weakness: She’ll ache and brood and bleed but she will survive. In her music, Cline always survives. In life, she became country’s preeminent female martyr. As The Simpsons taught us, there’s nothing funny about a clown getting hit in the face with a pie. No, in order for the gag to work, the pie has to humiliate someone with real gravitas and dignity—think a pre-corruption Sideshow Bob. On a similar note, “Crazy” and “I Fall To Pieces,” two of Cline’s signature songs, derive their awesome visceral power not from Cline’s weakness but from her strength, from listening to a singer in total control of her gifts sing about losing control, of giving in to sadness and despair and hopelessness. On “I Fall To Pieces,” Cline reaches beyond honky-tonk heartbreak toward an operatic effect. Cline was playing in a different league now. Her peers were less the guitar-slinging cowboys at the local club than Frank Sinatra singing a torch song in hushed tones or Judy Garland at Carnegie Hall. Cline was embraced not as a great country singer but as a great singer whose medium happened to be country. In one of those stories that seems just a little too good to be true, Cline reportedly hated “Crazy” the first time she heard it, perhaps because of the strange, singular delivery of the up-and-coming songwriter who wrote it and sang on the demo track, a young man named Willie Nelson. Cline would have been foolish to mimic Nelson, since nobody sings like Nelson, just as nobody sang like Cline. But the singer eventually found a way to make “Crazy” her own. Nelson’s version of “Crazy” is a sad, intimate lament, a low moan of world-weary lovesickness. Cline, in sharp contrast, turns it into an epic howl of heartbreak, 10 times bigger and more dramatic than life. When Cline left Four Star Records for Decca, famed producer Owen Bradley decided to give her albums a sound as big as her voice. Bradley gave her what would become known as the Nashville Sound: big symphony, big strings, and lots of big back-up vocals from the Jordanaires. Country’s reliance on the Nashville Sound—which later morphed into the equally slick, equally pop and crossover-friendly “Countrypolitan” sound—played havoc with the outlaw sensibilities of folks like Willie Nelson and Waylon Jennings, but it proved a godsend to artists like Eddy Arnold, Ray Charles (on Modern Sounds In Country And Western Music), and Cline. Cline didn’t just have the vocal and interpretive chops to compete in the Darwinian realm of pop music; she had the vocal chops to dominate pop. She was no mere singer; she was a crooner who knew how to make sweet love to a microphone and tenderly massage a lyric. “Walkin’ After Midnight,” “I Fall To Pieces,” and “Crazy” dominated both the pop and country charts. With that in mind, Bradley set out to capture the pop market with Sentimentally Yours. The album begins with “She’s Got You,” a haunting ballad of love lost. “Heartaches,” a rendition of a popular standard published in 1931, gives heartbreak a cha-cha-cha rhythm and continental swing. Cline proves equally adept covering Hank Williams (“Your Cheatin’ Heart” and “I Can’t Help It (If I’m Still in Love With You),” as well as “Half As Much,” which was originally recorded by Williams) and standards like “That’s My Desire” and “You Made Me Love You (I Didn’t Want to Do It).” Though it doesn’t appear on Sentimentally Yours, Cline also recorded a transcendent version of “Lovesick Blues” that, at the risk of being heretical, I prefer to the original. Sentimentally Yours offers a vivid snapshot of both where Cline was at the time of its recording and where she was headed. Alas, Cline’s time was running out. After surviving two car accidents that left her keenly attuned to her own mortality, Cline died in a plane crash less than a year after Sentimentally Yours’ release. Cline was by all accounts a wonderful human being in addition to being a great artist: She was renowned for her friendliness, generosity, good humor, and loyalty. Yet dying young proved essential to the singer’s ever-growing cult and legend. God only knows what Cline would have done if she were still alive today. Would she be covering Cole Porter or Roger Miller? Would she mentor obsessive fan k.d. lang (whose back-up band was called The Re-Clines in homage to her favorite singer) the way she did Loretta Lynn? Would she collaborate with outlaws and renegades, like Lynn did with Jack White on Van Lear Rose, or would she have devoted her life to Christianity and turned her back on secular music? We will never know. Cline remains frozen in time, stuck forever in a singularly intriguing, important moment of her life and career. In 1973 she became the first woman inducted into the Country Hall Of Fame. Glamour girls like Beverley D’Angelo (in Coal Miner’s Daughter) and Jessica Lange (in the 1985 biopic Sweet Dreams) have played her onscreen. 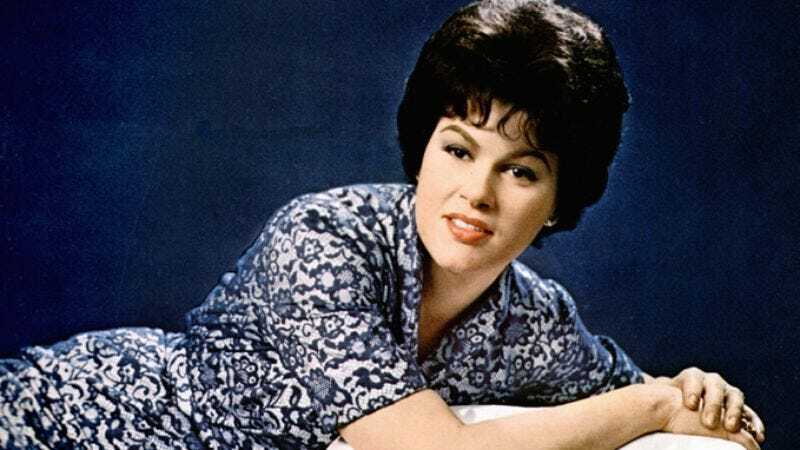 The hits didn’t stop coming after her death; since 1963, nine of her posthumous singles have hit the country charts, most notably “Sweet Dreams,” which hit No. 5. Cline made such a profound impact on Nashville that when it comes to the tangled, complicated, and tragic history of women in country, it makes sense to divide the 20th century into two discreet eras: pre-Cline and post-Cline. Dying a premature death made her a martyr and a legend, but it didn’t make her a star; her undeniable voice and indomitable personality did.